With the end of summer comes a lot of feelings and emotions. We mourn for the departing sun. We reminisce on all the good times we had. We say goodbye to our swimsuits for now and begin wishful thinking about our next holiday. But you’re forgetting one thing. It’s time to get excited for Autumn! Beat your end-of-summer blues by getting involved with the style trends for Autumn 2018. In this article, we’ll talk you through all of the fashion trends for Autumn 2018 that we’ve seen. We’ve been watching the catwalks, studying magazines and have put together all of the new trends that you need to know about. We know that the catwalks can be a little bit out there and most people wouldn’t actually leave the house wearing some of these clothes, nor do they have the thousands of pounds lying around it costs to buy them. So, we’re going to be looking more at the high street trends of Autumn 2018, whilst taking inspiration from the catwalks. The first and best place to start is with the Autumn 2018 colour palette. In summer, things get quite bright, loud and at times a bit garish. That’s why autumnal colours can be such a welcome change. The colours are warmer, the clothes look cosier and they match the natural colours of the leaves and Autumn in general. Mother nature can be your accessory, if your clothes are on point. Here’s our run-down of what colours to wear for Autumn 2018. The number-one stand out colour we’ve seen is brown. Brown is generally a regular feature in Autumn but this year, it’s everywhere! Virtually every major fashion house has incorporated it in their collections, from headwear to shoes. So, the first colour on your shopping list should be brown and any variations on it. Camel, beige, rust, meerkat, tan, coffee, caramel, they’ve all been featuring heavily and to great effect. Hark back to the 70s for this one and use that decade as your style inspiration. When it comes to colour blocking, don’t be afraid to mix it up with some unusual combinations. If there’s one thing we’ve learned about 2018, it’s that it’s the year of the statement. Whether it’s political or simply to turn heads, this year is about making your mark. A main colour trend for Autumn 2018 is being bold. Designer collections have featured everything from bright primary colour combinations, to pretty pastel palettes and even super-striking neons. Be bold and make your statement. As much as fashion houses like to take it back to yesteryear, they also like to look ahead. Metallic silver has been another star of the runways this year. Several designers have featured silver suits. We would say they’re futuristic, but they look more like what Hollywood costume designers in the 80’s thought 2018 was going to look like! But it works, and will definitely turn heads. For the high street though, you may want to keep it bit more low-key and subtle with just one key statement piece against a more toned-down overall look, or with some silver accessories or silver detailing/trim on your clothes. Now we’ve looked at 2018’s Autumn colour trends, what’s actually in fashion this Autumn? We’ll carry on with the colour theme by looking at some prints, we’ll look at what clothes are in this Autumn and round it off by talking about our favourite thing: Shoes. We won’t go too heavy on the footwear though, as we have an article dedicated to what shoes you should be wearing this Autumn coming to our blog very soon! First up, animal prints. These have been here, there and everywhere. The most prominent being zebra and leopard, of course. From coats to dresses to boots to hats, they’ve been doing the rounds with panache. Mix and match from different creatures and embrace your inner animal. On the theme of prints, floral prints are also well represented this autumn. A stand-out for us from the catwalks were floral boots which we think look absolutely fantastic, but florals have also been appearing on clothing too, to great effect. A regular staple of Autumn fashion are Balmoral-inspired prints and patterns. Look to Her Majesty the Queen for style inspiration this autumn. Think headscarves, argyle, arran, tweeds and plaid. Layer them up, mix and match, remember that it’s all about being bold. The best thing about autumn? Wearing a coat again. If last winter is anything to go by, we could be in for another chilly one. Thanks, climate change. Do not fear because excessive protection from the elements is in this season. You may not want to go too far, but with big coats, puffer jackets and layering, it’s all about protection when it comes to coats this Autumn. Hats are back in a big way this Autumn, too. Not that they ever left, but hats, headscarves, berets, even balaclavas have been doing the runway rounds. Some designers even featured crowns and headpieces. Great for parties, don’t get us wrong, but maybe leave the crowns for fancy dress and stick to some silk headscarves for everyday! This Autumn will be forgiving to bad hair days, you heard it here first. Blankets coats are one of our favourite emerging trends this year. They match the season very well, they feel cosy and when done right, they look absolutely amazing. We remember a time when wearing a blanket over your clothes was reserved only for hungover trips to the supermarket for comfort food. Not anymore! Need some accessories to spruce up your Autumn wardrobe? Statement scarves are making a splash this Autumn. The scarves we’ve been seeing look like they’ve been designed by someone who normally designs statement jewellery! Again, be bold and don’t miss an opportunity to wow people. Even scarves can be jaw-dropping. Finally, what we’ve all been waiting for. The shoes. Brown and animal prints have also been featuring heavily on shoes so take our earlier tips on those to your feet. Chelsea boots have also been everywhere and looking gorgeous. Block heels show no sign of going anywhere. Team them with socks for a cooler-day-friendly look that’s straight off the catwalk. When it comes to street wear, big thick soles are still the order of the day. Your dad’s trainers that you thought were too chunky and clunky are now setting the runway alight. The hiking boot/trainer crossovers that have been making waves in the men’s footwear market have also been making inroads in the ladies’ market too. Watch out for our article on the top shoes you’ll need this Autumn, coming soon! 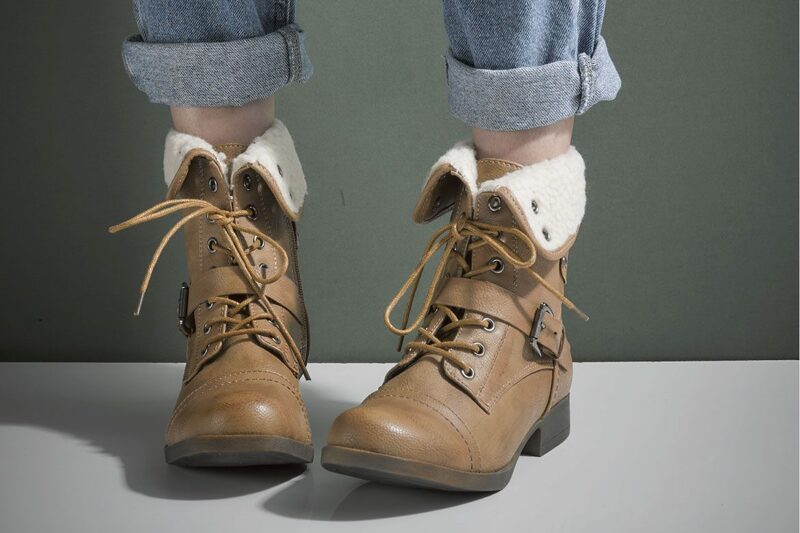 Shop our new arrivals section for the latest Autumn shoes and boots! For your all your Autumn 2018 needs, check out our website for our new arrivals. Available at great prices and with free & fast delivery, it’s the best and cheapest way to give your wardrobe a little refresh for the season. Shoe shopping doesn’t have to cost a bomb and here at Shoe Zone, you’ll save money on the some of the best shoes around. See how much you could save on our website! Holiday Suitcase Essentials For All The Family!